The Fig (Ficus retusa) makes an excellent indoor bonsai as it is very easy to grow. just keep the soil damp, mist regularly and prune occasionally. Find a position in a warm room with fairly good daylight (direct sunlight not essential) and this magnificent specimen bonsai will be happy. Don't forget we are bonsai experts so if you need help - just ask. See below for full details of this incredible tree. This incredible large bonsai has great character; it is very easy to care for and would be a great bonsai for beginners and will also tolerate lower light levels. The fig has wonderful deep glossy green foliage which is lush and forms a wonderful canopy. Would also be highly suitable for an office environment. This is the bonsai which you would receive. A amazing premium Fig bonsai in an ornate ceramic bonsai pot. The Fig is very easy to care for and will even tolerate rooms with poor light. 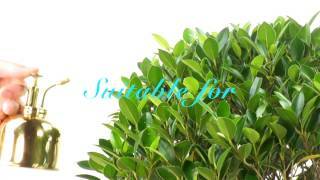 It has lovely bright green glossy leaves.